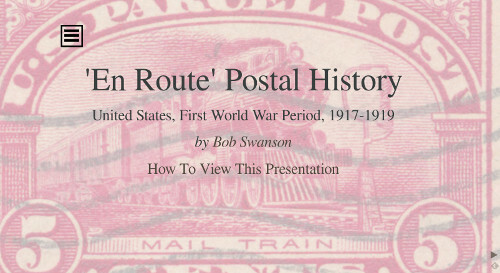 Each of the following on-line presentations showcase a particular topic among the many possible subjects of military postal history. These "mini" presentations were created by members of the Military Postal History Society. The Society solicits additional mini-presentations from its members. These small presentations are intentionally short, and use only web technology to show an on-screen set of slides, much like PowerPoint(tm) would perform on a Microsoft or Mac computer. These presentations can be viewed on phones, tablets, and computer screens without the need for additional special software.